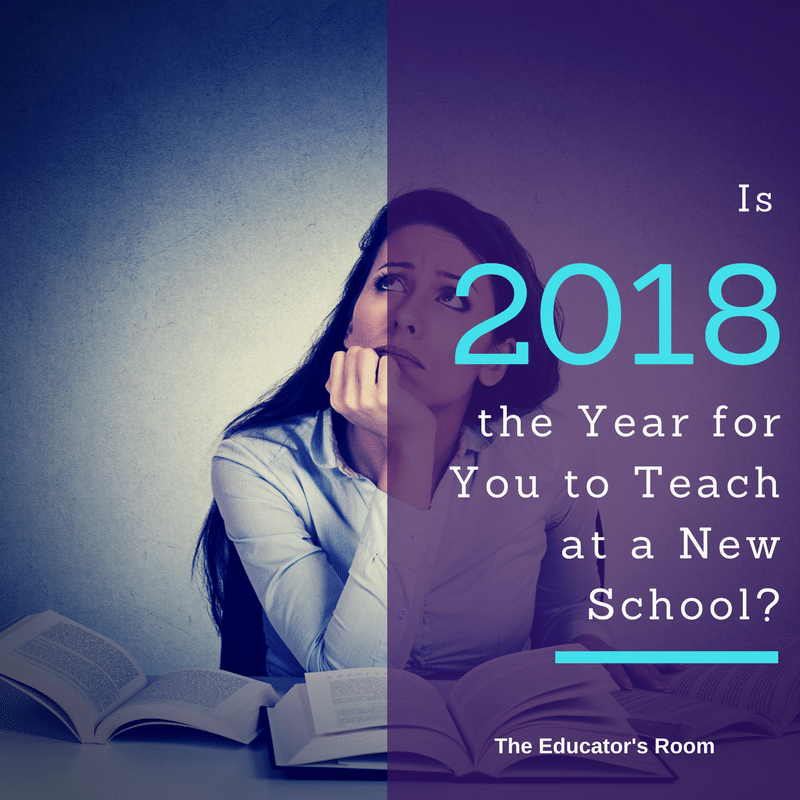 Is 2018 the Year for You to Teach at a New School? Among education writers, I am most known for my piece, “Teachers Quit Principals, Not Schools.” Currently, this piece has been read more than 650,000 times. This piece struck a chord with educators around the country because the reality is many teachers are not happy working in their current school environment and although the principal has a huge impact on the school, there are additional factors to consider. Many teachers are dangling on a thread that is about to snap, but maybe all that is needed is a change in environment. Below, I have included questions to consider when deciding whether or not you should leave your current school. Is your school contributing to your mental health decline? The school I left, in the article I mentioned above, was wearing me down mentally. It is taxing to show up to work each day and feel unsupported. Working in education should be fulfilling; it should lift your spirits to know you are changing the world through educating children. If you are in a toxic environment, it can drown out the love and joy you have for this profession. Have you picked up a bad habit (or two) to cope with your job? If you are overeating, abusing alcohol, abusing prescription or illegal drugs or verbally abusing people at home as a result of your stress from your school environment, you need a change before you destroy yourself in the process. Addiction can be hard to overcome and staying in an unhealthy environment will make it difficult to overcome your struggles. Find a new school and seek help to end your habit. Are you fearful of your administration? It is hard to become an effective educator if you are afraid of your principal. No administrator should use fear to rule a school and to obtain compliance. Some administrators are quick to write up and reprimand teachers. We know from our students that constant discipline without support does not improve our students’ performance, so why would it help change the behavior and academic data of teachers? If you are fearful of earning a poor evaluation or feel that every misstep will be documented, you need to find a more supportive environment. Are you fearful of your students? You shouldn’t be cowering and crying day in and day out because of student behavior. The main office or your school’s police officer shouldn’t be on your speed dial. In what other profession would people continue to go to a job day in and day out where they are afraid of the people they serve? I don’t know many people who can work effectively while in fear. If your school has become a living nightmare because there aren’t systems in place to help with behavior issues, don’t be afraid to find a new school. Do you dread driving to work each day? When Sunday rolls around do you start feeling depressed because you don’t want the school week to begin? If you have to give yourself a pep talk just to go to work or you glance over at your bills to remind yourself you need to stay employed, you need to find a school that will bring your joy back. Are you seeking leadership opportunities, but keep getting passed over? I worked with a teacher who would put her name in the hat time and time again and the principal would never choose her to lead anything. This once vibrant educator started questioning herself and her skills. Finally, she left and was hired by another school. At this school, she had support from her principal and was able to lead a few initiatives. If your school is not supporting your professional goals, you should find a school that will. Do you hold multiple certifications and desire a different role? I taught English for eight years before switching to another role. During my second year in the classroom, I was struggling with helping my English language learners to make academic gains in the classroom. I enrolled in a Language Education master’s program to learn more and to also obtain my English language learner license. I then had the opportunity to co-teach with an ELL teacher and I decided that I wanted to become the ELL teacher. I was at a crossroad. I had been in my district for years and I didn’t want to leave, but I also wanted to try something new. For two years, I kept hoping I could obtain an ELL position within the district, but I didn’t. I then accepted an ELL position in another district. I’m glad I did because it fulfilled a desire I had. Don’t let your desires go unfilled. Step out and find the position that you want. For some reason, there is shame around a teacher leaving for a better paying teaching job. I teach in Indianapolis, Indiana and although the media makes it seem like Indianapolis Public Schools is the only school district in Indianapolis, it is not. There are 11 school districts within Indianapolis’ boundaries in addition to various charter school organizations and they all pay different rates. Not that I’m saying all charter schools pay low, but when I worked at a charter school, I was making $29,000 and at the time I was paying for my master’s degree and infertility treatments. I no longer had any debt from undergraduate school, so I didn’t want to take out any loans to pay for graduate school. I had also spent close to one-third of my salary on infertility treatments which weren’t working at the time. Yes, I left for more money and I earned a substantial amount more. In case you were wondering, the second year at this job, the treatments were successful and I gave birth to identical twin boys. Whether you want to earn more money to pay off a debt, to travel or just because, you should not feel any shame about going somewhere that will pay you more. The hardest part is deciding you are going to leave and then taking action to leave. One day, two colleagues and I were talking and one of my colleagues brought up once again that she was going to leave like she did every year and the next year, there her name was again on the staff roster. Stop talking about it; take action! In her article, “An Awful Moment: Choosing to Say Goodbye to a School” Sherlene Merritt reminds educators, “Free agency season is now open. Go out and get your well-earned peace of mind in a teaching environment where your skills are appreciated and rewarded.” Make this year the year you take care of yourself. Educators are notorious for neglecting their needs and desires. Update your resume and start applying and hopefully you will find your right fit school. I’ve experienced these same emotions – and left three schools because of them. I have had amazing principals for the last four years and am so much happier!